The Trump administration, including Environmental Protection Agency (EPA) head Scott Pruitt, has undertaken an assault on environmental health protections. This assault includes deregulation, defunding, staff cuts, and the corrosion of science-based policy. This assault is severe, but is it unprecedented? Based on EDGI’s research, recently published in the American Journal of Public Health, the answer to that question is both no and yes. On the one hand, the Trump administration’s assault on the EPA has clear precedents in the early Reagan administration and the George W. Bush administration. Like Reagan, Trump proposed deep budget cuts to the EPA. Trump has also, like Reagan, penned executive orders that are intended to stifle environmental regulations. And like Pruitt, Reagan’s pick to head the EPA, Anne Gorsuch, alienated agency staff. “We’re going to do more with less and we’re going to do it with fewer of you,” she said in her inaugural address to EPA, according to one of the dozens of former EPA employees we interviewed. Gorsuch followed through on the promised staff cuts as well as cuts to enforcement. Pruitt’s EPA has done the same. 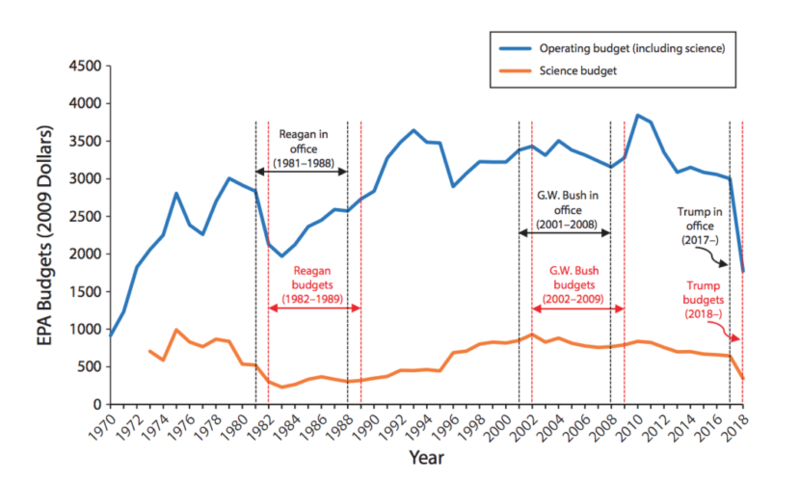 Reagan also dabbled in undermining science-based policy, but the George W. Bush administration made this its modus operandi. The administration hid a report on mercury’s health effects from the public, required reports to include language about the uncertainty of anthropogenic global warming, and even prohibited employees from discussing climate change, according to our interviews. Similarly, the Trump administration has removed or obscured information about climate change from websites, put a political appointee in charge of scientific grants, and proposed to create a massive, public forum to artificially litigate settled questions of climate science. In these and other ways, such as the selection of EPA political appointees from regulated industries, the Trump administration is similar to the Reagan and Bush administrations. But its trenchant combination of Reagan and Bush’s tactics make it unique. In addition, the political context has changed considerably since Reagan and even since George W. Bush. Environmental protection, once a solidly bipartisan issue, has become polarized, as indeed political parties have become more polarized in general. Republicans have shifted to the right and many have come to not only dismiss environmental protection, but actively campaign against it. Meanwhile, the political power of fossil fuel and chemical corporations has grown, as have the size and power of conservative think tanks and media. The situation is not hopeless, however. Just as under Reagan administration, EPA employees have fed damaging information about political corruption and the misuse of science to the press. While the current Congress is less amenable to investigating wrongdoing at the EPA than the Congress during Reagan’s presidency, it’s possible that enough pressure will mount regarding Pruitt’s actions that Congress will investigate. There is some hope for bipartisan approaches to environmental protection, as 2016 reform the Toxic Substances Control Act shows. And outside of D.C., state and city governments are moving ahead with climate change policies and programs. For our full historical analysis of the Trump administration’s approach to the EPA, and what it means for environmental health now and in the near future, see our article “History of US Presidential Assaults on Modern Environmental Health Protection,” in the American Journal of Public Health, 108, no. S2 (April, 2018).